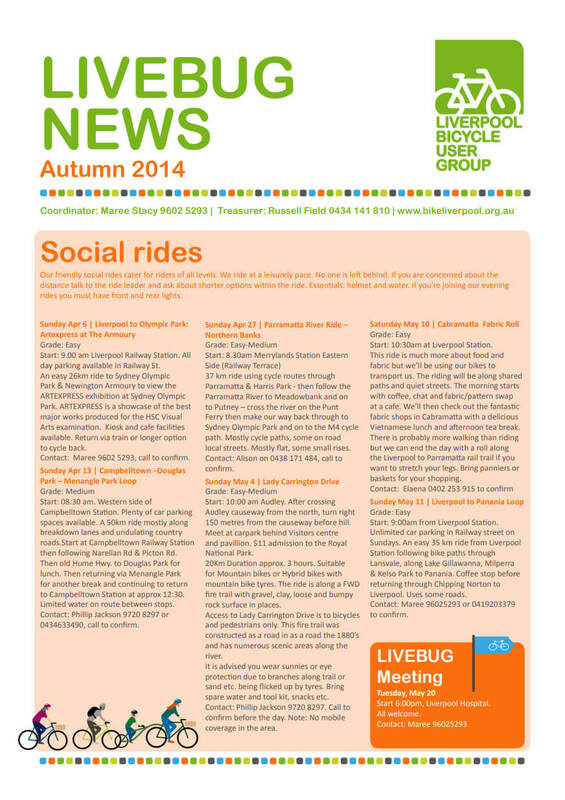 Our quarterly newsletter for Autumn 2014 has been published. Thirroul to Wollongong – 16km. Scenic coastal ride on shared paths. Coffee stop at the harbour – If you would like a shorter ride you can leave us at the golf course and ride 1.5km to Wollongong station to return by train. Wollongong to Port Kembla – 11km – Around the industrial heart of Wollongong on shared paths and quite back streets. Some great views of the Port Kembla steel works. Lunch at the Westfields Food Hall Warawong. Option to return after lunch by train for shorter ride. PhillipContact 9720 8297 | 0434 633 490 to confirm. Error: Error validating access token: Session has expired on Wednesday, 06-Feb-19 02:49:57 PST. The current time is Friday, 26-Apr-19 03:11:44 PDT. Liverpool BUG is affiliated with Bicycle NSW who are the peak body for cycling advocacy in NSW. Members are encouraged to join Bicycle NSW and the enjoy benefits they offer.